Awesome Bubble Chairs and Ball Shaped Chairs! Awesome Bubble Chairs and Ball Shaped Chairs for a Cool and Modern Living-Room! Bubble chairs are exactly that! Cool chairs that look like a bubble! They are super stylish and super cool to have in your living-room or even outside, by the pool! Some are clear bubbles, others are in solid cool colors! Most of them will hang too, for the ultimate ‘bubble’ experience! Are you ready to find that perfect bubble for you? 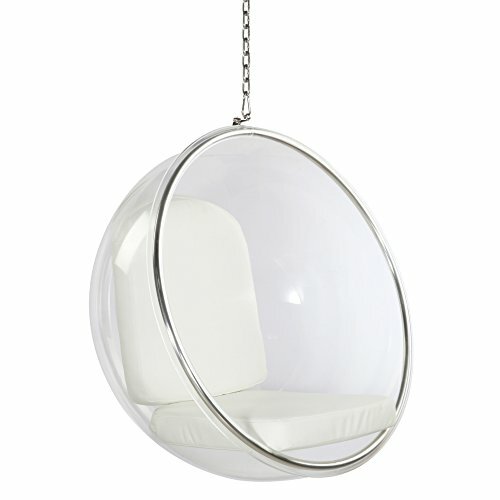 Look how modern looking this clear acrylic cool hanging bubble chair with cushion inside is! You can even have a couple of them hanging around! I am totally all for it! 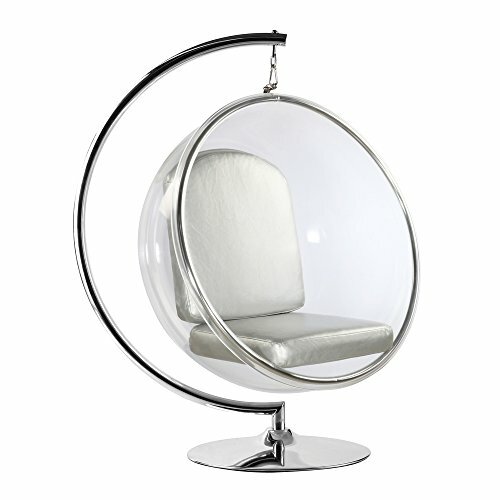 Another cool and modern clear bubble chair with cool silver cushions inside! Just perfect to improve your living-room! You can have it near a window or by some cool plants! The chair has a polished chrome base and it hangs from a chain. Very Cool Ball Shaped Chairs! Have you seen these stylish circle chairs for Sale? 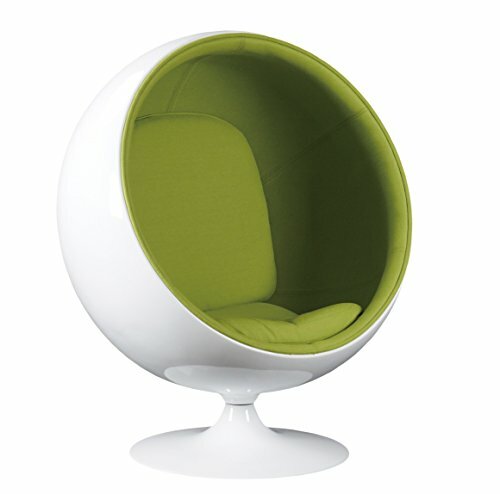 This is one of my favorite ball-shaped chairs! The inside is fully lined and it will also offer you a quiet place to be! Whether you call these bubble chairs or ball-shaped chairs, you are thinking about a cool and modern round chair for you to crawl into and forget about your worries! This one is gorgeous, super ‘retro’ and it has a cool all-yellow interior! You are crazy to try it out, aren’t you? Your very own private retreat! 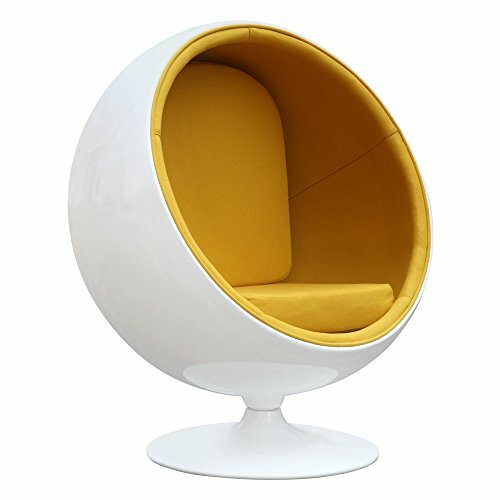 Just imagine how modern and very cool looking this white ball shaped chair with a gorgeous all-yellow interior will look in YOUR living-room! Actually, it is a ‘retro’ chair, but it looks modern! You can have it by itself, as a focal point in your living room, or you can get two and pair them up in a cool corner! You can choose between 3 fun color combinations!! 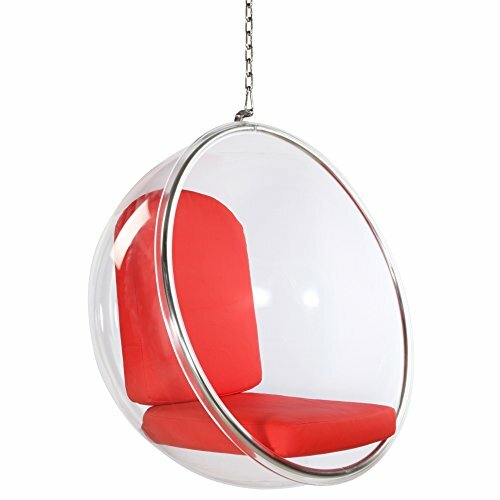 This is the perfect ‘hanging bubble chair’ for sale! It is fun ‘retro-style’ clear bubble chair with bright red cushions. Just pick the perfect spot in your house to place it and create a cool ‘quiet’ place for you to read! *I hope you enjoyed my selections of cool bubble chairs and ball shaped chairs from this page and were able to choose one for your home!